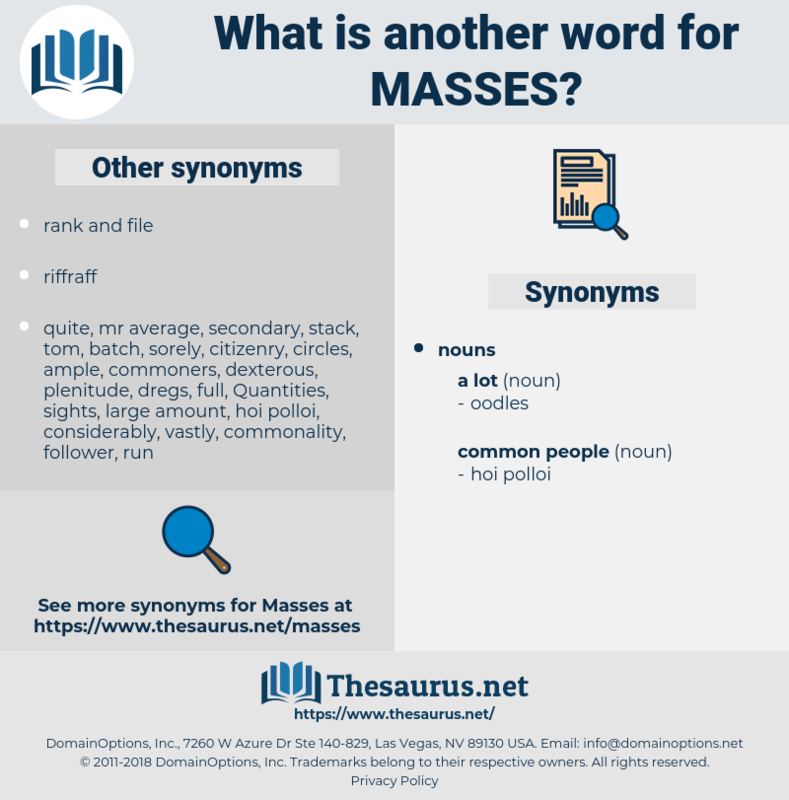 What is another word for masses? MAS, AMAS, Concentrations, numbers, sledgehammers, demonstrators, constellations, grassroots, sums, grass-roots, earths, destructions, swarms, gatherings, Majorities, Quantities, formations, streams, proportions, constituents, values, loads, allies, civilians, volume, volumes, dimensions, multitudes, removals, messes, heaps, clutches, Americans, extents, Constituencies, REAMS, chassis, clusters, expanses, amounts, Communities, compatriots, numerous, Everybody, inhabitants, spectators, deployments, brethren, brothers, dozens, media, terres, Soils, vehicle, peuples, streets, NATIONALS, mortals, troops, ranges, stretches, arrays, sources, groupings, buildups, piles, Siblings, Respondents, Fatalities, poids, subgroups, LUMPS, Clumps, mountains, dwellers, MOBS, Deleting, Bodies, lots, lands, tracts, grounds, tourists, factions, residents, scores, deaths, citizens, VOLS, flocks, fans, mounds, cadres, hangers, fleets, Patches, Colonies, batches, bunches, groups, PESOS, bundles, packs, checks, Grapes, blocs, bills, hordes, blocks, pools, number, reefs, feelings, DO, name, Rallies, peoples. population, Populations, audience, audiences, crowds, masse. 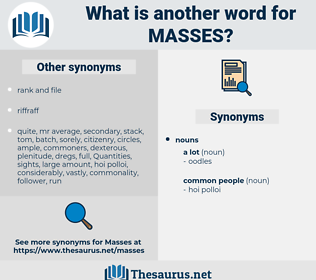 massifs, gathers, estates, Weights, droves, population, Populations, audiences, crowds. Smoke, steam, masses of rock all trying to rise. In order to make the slaves useful or happy, they must be educated in masses. mousy, manus, mimic, minge, mesa, massasauga, minos, Mauna Kea, mannish, myg, mayacaceae, masse, mimesis, mayaca, munjuk, mongoose, monomaniac, masai, minus, mc, Minnie Mouse, mishegoss, mick, mousey, mango, mesozoic, monegasque, musci, mcg, mycosis, MCIA, ming, monoecious, Magha, magh, majagua, msh, macho, mushy, mimus, mansi, messy, mosque, mm hg, miss, minimum wage, mince, mg, Micah, managua, myosis, mace, make way, mesh, musca, mensch, minkowski, menace, menses, magi, miscue, minimize, mosh, momus, mash, musk ox, monkey, manse, meshugge, mack, mag, mwanza, missy, mush, muzjik, minsk, mock, momos, monaco, make, messuage, mezuza, mews, msg, means, meuse, mangy, mahagua, music, mucous, mousse, moneses, Monoicous, mask, mooch, myaceae, myiasis, monas, msec, manky, manic, mickey, mahuang, mazy, miwok, mug, muggee, munich, meq, musgoi, mange, mosey, mawkish, mink, Manichee, mnemonics, moschus, meniscus, macaw, moscow, musquash, mocha, meshugaas, muskogee, mohawk, monk, mass, mummichog, mensa, masa, mining, muncie, Massawa, maniac, musgu, mucus, mimosaceae, mach, munja, monish, mhz, Meno Mosso, manx, mica, magic, max, mishegaas, manna ash, mays, mujik, maikoa, musky, masseuse, moses, magic eye, much as, moo-cow, mucosa, Manes, mus, MKO, muss, munj, munch, maize, mensh, mezzo, manque, minimise, meek, massage, messiah, meiosis, mosaic, mussy, mung, manchu, masque, mucose, man jack, mx, meninx, moksa, Mimamsa, miosis, mesua, musk, maja, moxie, monkish, muck, mucky, minx, mess, maxi, mecca, muzhik, missus, musa, maguey, macaca, ms, mix, meanness, menage, moke, meg, mexico, misuse, meninges, mongo, maquis, meshuga, mniaceae, mezuzah, macaque, mouse, moose, muse, mingy, monecious, manis, MAK, meshugga, mangey, Micaceous, mesic, message, mike, musaceae, menziesia, much, macau, msasa, make hay, maze, mojo, mons, misgauge, missis, Micheas, meaning, manage, mashie, mako, mimosa, msc, MEK, mysis, mac, moujik, musk hog, macao, moaning, moss, men's, manioca, Minimus, mashi, magus, muggy, minacious, mayonnaise, mossy, moussaka, muzzy, manioc, mnemonic, Ms., mayeng.